Currently internet routing table is growing drastically and every ISP is looking to move ahead over IPv6. But what I think ISP really no needs to migrate the whole backbone over IPv6 because the core doesn’t have more than 5000 – 10000 routes in extreme conditions. Enabling IPV6 simply putting an extra overhead with OSPFv3 and really cumbersome to memorize the schema. So it’s very difficult for operations to troubleshoot the problems with no time. Customers can use the IPv6 but BGP 6VPE is the best solution to provide the MPLS services or vrf nat also works for same. Till the time organizations are thinking of rolling out IPv6 services. But after watching LISP video I got feel good factor that Cisco Engineers are doing great job to stop the depletion of increasing routing table. Farinacci along with team has proposed the LISP solution so that the internet routing table could be decrease. Currently internet is having approx 288000 routes and increasing day by day. LISP stands for LOcator/ID Separation Protocol which will help us to reduce the internet routing table size. But still it is in the deployment phase and everyone is waiting eagerly. As per LISP architecture designers will add a new network layer underneath the network layer, in other terms one can say it’s like encapsulation, legacy of Cisco. Currently every source is having information of every destination consequence internet routing table size increases. Hopefully we will be getting LISP in the coming years. Full problem statement can be downloaded from here. This post will cover the ip dialing from Microsoft PC with using PPTP protocol. Once PC is able to dial LNS which is 1.1.1.1 there after radius will authenticate the username and password sent by the PC. Once it is authenticated LNS will allocate the ip address from the pool configured to PC. a) PC will dial LNS public ip. b) A ppp call will come to LNS and it will forward to the radius. c) Radius will check the credentials and replied back to LNS. d) There after LNS will allocate the ip address to PC from the Pool configured. Username shivlujain and password cisco is created and the same will be provided during dialing from PC. ppp58 PAP: I AUTH-REQ id 30 len 16 from "shivlujain"
ppp60 PAP: I AUTH-REQ id 31 len 16 from "shivlujain"
Show users will provide you the list of connected interface. In the given scenario loopbacks are advertised as /24 subnet. So local router will advertise loopback0 as implicit null to it adjacent neighbours with pop tag but the adjacent routers are receiving Untagged entries. For simplicity I am using R1 to capture all the outputs. In the given outputs I am verifying loopback 0 of router 3. The loopbacks are advertised as /24 subnet mask and adjacent routers are receiving /32 entry in the routing table because by default loopbacks interface in ospf treated as stub host. Now if you check the adjacent router routing table loopback entry will come as /32 but it advertise the loopback (172.16.3.3/24) as implicit null. Now check the routing table entry of 172.16.3.3 and mpls binding in R1. See carefully the output tag of 17216.3.3/32 which is Untagged. Instead of Untagged it should be pop label. POP Label:- The router before the last LSR (the penultimate hop) pops the label and transmits the packet without the label. The last hop is called the egress LSR. Untagged Label:- Untagged label in the LFIB when the IP prefix is a directly connected interface, a summary route or the next-hop router has not advertised the label. You can see the “The next hop router has not advertised the label”. The next router is advertising implicit null for /24 but routing table doesn’t have any entry for the same. Solution:- The same type of problem I faced during my CCIE lab exam. It was supposed to advertise the loopback with the exact subnet but we usually get the entry as /32. So remember this command which will resolve the whole issue. Command is “ip ospf network point-to-point” under loopback0. Every enterpries needs a remote access during roaming and vpnd is the best solution which can be used witout installing software on microsoft windows. This type of solutionis also known as ip dialing. For remote access laptop/pc should be connected to internet and able to reach the global internet ip address. If this option is available then its very easy to deploy the solution. I have tested it on a simple scenarion in which PC is connected via DSL and using simple PPTP(Point To Point Tunneling Protocol) to dial the public enterprise ip address. In the above topolgy Enterprise HO router is enabled with VPDN(Virtual Dialup Network) so that it can work as LNS(Layer2 Nework Server). Now Remote PC will dial LNS public ip adress and after successfull authetication remote PC will be allocated with a public ip address and able to access its lan routers. Authentication is done locally from router itself. Vpdn enable - This command is used to make router as LNS. accept-dialin - This command is used to accept dial services. protocol pptp - This command is used to accept protocol as pptp during dialing which is used by microsoft PC. virtual-template 5 - This command is used to bind virtual template 5 with vpdn-group1 becasue after dialing virtual access interface will come up. local name - Host name will be used here. ip local pool TEST1 - A pool with ip addresses as configured. It means only 5 persons can dial and able to access the lan from outer cloud. ppp authentication pap chap - This command is used for autheication. If the mplsvpn backbone is running over dense mode and serving mvpn services and designers want to migrate the dense mode to ssm. But the mplsvpn core is using type 2 rd which is actually reserve for inter-as mvpn and some of the core routers are running over SB or SRC series ios. During the migration of core; one should not face any type of issue but of mvpwhen migration n customers will start you might face a problem of pim neighborship of vrf not coming up but mdt tunnels up. The main reason for this is that mdt-safi which I have already covered in my previous post. In these cases, ipv4 mdt need to be activated with RR. As soon as it will be configured you will be glad to see mvpn vrf pim neighborships come up. During the implementation of NTP we faced lot of issues. I am covering almost all the issues which will be useful for others during its deployment except stratum because you will find lot of information about stratum. The main purpose of writing this document is that I have never seen any of the documents available on internet which describes the issues. a) Whenever any of the router works as NTP master by default 127.127.7.1 address comes. So care should be taken while securing NTP with acl to permit this ip address. This address is useful for the peer synchronization. b) While using access-list for peer always permit 127.127.7.1 address in the acl. By mistake if it left both the peers will never sync with each other. If you are getting only tilt(~); it means there might be some problem in the acl or 127.127.7.1 is not permitting in acl. Check your acl and configs. As soon as you add 127.127.7.1 output will be changed. Note:- NTP doesn’t support named acl. Whatever ip address is defining in peer acl should be manual added with peer command also else it won’t work except 127.127.7.1. Being a slow protocol, at times clock doesn’t update. For that need to remove the configs and add them again. d) NTP doesn’t support authentication for clients. 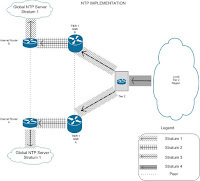 This post will cover how to implement NTP in service provider network. The document will be used as reference for enterprise and corporate networks also. In the given figure two routers which are 7600 are used as client who is getting NTP clock from the global servers. The same clock is being distributed to the downstream GSR routers. Thereafter GSR are distributing clock to the downstream tier 2 routers. This is the hierarchical implementation of NTP. In fact implementation of NTP is really a awesome job if you are having patience. 7600 routers are getting global NTP clock of stratum 0 from global servers. List of global server is given below. Once the clock is received by 7600; both will work as master for the downstream GSR routers. Now GSRs will receive clock from 7600 as client and distribute the same clock to the downstream tier 2 routers. For sending the clock GSR will act as server for tier2 routers and client for 7600. Now tier2 routers will receive the clock from GSR as client and distribute the same clock to the downstream tier2 routers. For this we need to implement tier2 routers as servers for downstream routers and client for GSRs. Access-list is used for security purpose because once the routers will become as server; internet cloud can use the same routers as reference clock. Note:- 127.127.7.1 is used for synchronization of clock between the servers in case of failure on global NTP server. Shreedhar M. and Varghese G. , "Efficient Fair Queuing Using deficit Round-Robin,"
Yesterday when logival interface of NPE-G2 router was deleted, at the same instant physical interface got down. The ios which was using 12.2 31 SB13. As part of our third quarter communication package, we are delighted to announce that Cisco will be presenting, Walk the Tech Talk series on NDTV Profit, to be anchored by Rajiv Makhni, the well known NDTV technology expert. The first of the 6 part series will be aired tomorrow, Saturday, 28th February and will feature Mr. Laxman Badiga, CIO, Wipro Technologies, as the first guest. The first five episodes will feature one-on-one interviews with 5 of our key customers and shall demonstrate how Cisco’s collaboration technologies are providing each of them with operational efficiencies and a much needed competitive edge especially during these difficult times. The final episode will be a first-of-its-kind on Indian television, where a panel discussion will happen over Cisco TelePresence, featuring all the five CIOs/CTOs interviewed earlier. NDTV Profit will telecast the series every week at 8:30 p.m. on Saturdays with a repeat show on the following Sunday at 12:30 p.m.
Don’t miss this special series on NDTV Profit – as this will be a true showcase of how Cisco technologies enable the Human Network. From the last one month we are looking for a internet vrf leaking solution in SB13 ios but today finally cisco declared it as a new bug CSCsy29604 which is hampering SRC and SB series. In the last post we have seen how to check the mtu on windows vista. In this post we will see how to set the DF big on a packet. On command prompt ping yahoo.com -f -l 1460; you will see the reply. Now ping yahoo with 1500 bytes, you receive packets need to be fragmented. -f is used for donot fragment. MTU is one of the problems which is being faced by everyone when the media is ethernet. But in this post I am not going to tell you about the problems faced with MTU. Simply I wanna show a very simple command in vista which can help you to check the mtu size of your windows. In this post I have covered how to provision Internet to customer if service provider is having the MPLSVPN backbone and the customer is looking for internet as well as vpn services. R2 router is having a directly connected interface with upstream service provider router. A vrf INTERNET is configured on R2 with default route pointing towards the 2.2.2.2 which is available in global routing table. For achieving this global keyword is used. Click here for more information about global keyword in VRF. From the above output of bgp routing table of VPNv4, no default route is coming in the gp routing table. The reason for this is that 2.2.2.2 is not available in vrf INTERNET routing table that’s why it is not installing in the vrf INTERNET bgp routing table. For its completion you need to add a 0.0.0.0 network under address-family INTERNET. Hurrah! Received default route in bgp routing table of vrf INTERNET. Being MPLS is enabled in the whole cloud and need to check the label for route in vrf INTERNET. I love utmost the given commands because it gives the full information about the labels. 18 label is generating for given route and r2 will advertise the same route towards the cloud to RR or other PE routers. Configure R1 and customer vrf named CUST is coming on same pop. In my previous article of “How Internet Works In MPLS” depicts that a vrf route leaked in global. But in this article CUST vrf requires the default route to access internet freely. *> 192.168.1.0/30 0.0.0.0 0 32768 ? Till now CUST vrf doesn’t have the default route. For that we need to play with route target. INTERNET vrf is exporting 1:2; in other words one can understand the INTERNET is saying to MPLS cloud those who want to surf internet, accept me. Now CUST vrf wants to surf internet; for this it needs to import that default route in its vrf by using route target import 1:2 in its vrf CUST. You are amazed because I have been using vpnv4 keyword in the above paragraph. VPNv4 means label will be pushed from R1 to R2 then R2 will remove the label and forward the ip traffic. As per process two labels should imposed on packet; one label for vpnv4 and another label for IGP. But in my scenario R2 is the directly connected router so that implicit null generated for 10.10.10.10 and vpnv4 label of 18 is imposed. This is the same label which is shown in above output of INTERNET vrf. The foremost difference is that in INTERNET vrf label is “in” and on R2 it is showing as “out”. The foremost advantage of using this scenario is that only a single INTERNET vrf need to be created in the whole cloud and where ever customer is looking for internet simply import the route target of the VRF. Ease of manageability. R2 router is having a default route towards the upstream service provider. On R1 vrf CUST is created and fa0/1 is part of vrf CUST. Note:- Even is your primary path is mpls enabled and by anyhow you forgot to enable mpls on back path; No issues even in that case internet customers will never face any type of downtime. A new command is added in vrf with global keyword. Meaning of this command is that in the vrf table default route will be destination but the next hop which is 10.10.10.10 will be searched in global routing table. Here the actual route leaking comes in picture. For more read “How internet works In MPLS” which depicts the flow of traffic. Actually this PE will convert the MPLSVPN packet to ipv4 packet and forward towards the 10.10.10.10 which is the loopback address of PE2. When the ip packet reaches at PE2 it gets the default route towards the service provider. Now check the ping of 4.2.2.2 from CE router. Woh! Ping is not working. Do you know where the problem is? Of course you could answer if you would read “How internet works In MPLS”. Actually for reverse traffic the customer global route which is 3.3.3.0 is not in global routing table of R2. For that we need to add the route in the global towards the customer end on PE1. Still ping wouldn’t come because R1 knows about the static route and what about the R2 router. Of course need to redistribute static route in OSPF. Note:- Global ip addresses are used only for testing purpose and the scenario is simulated on local lan by changing the name of routers like internet etc. IETF has published a new informational RFC of LDP IGP Synchronization. Geerts has explained it well and the same draft was written by him. The same feature is being provided by cisco in the new released trains. Reminiscent 5th February when we faced a issue with SB13 and consequence faced downtime for internet customers. Why I was so upset and working continously on to the problem because the IOS was being tested arduous. Continued with my previous post of SB 13 internet vrf problem . In this post we are able to know where the problem is. Now waiting for the cisco team how they are going to announce it. The problem was reported first by us to cisco with proper findings and results. a) Logs taken during that time when the PE was working for both INTERNET vrf and CUST vrf with IOS SB13. Results:- Customers were not able to access internet. In the above output one can see the value of ifnum: Actually it is showing the outgoing interface with next hop ip address and in Output chain clearly adjacency is showing. In the above output one can see the value of ifnum: Actually it is showing none which lucidly says that no outgoing interface and in Output chain clearly no adjacency is showing only unresolved is there which means next hop adjacency is unable to built. This is the primary reason for not working because CUST vrf is not able to know whats its outgoing interface along its adjacency table. But is the customers direct come in INTERNET vrf then they will work becasue INTERNET vrf is having information of outgoing interface with valid next hop address and adjacency. So the next time if you are facing the same issues try to use the above mentioned commands. Today everyone is curious to know the performance of the bandwdith provided by the service provider. I got a awesome tool which can help to get the good results.